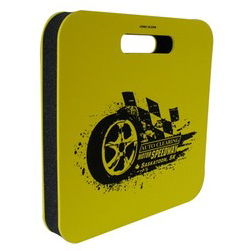 Order Custom Printed Seat Cushions that are great for sitting in the bleachers supporting your favorite team, watching a race, etc. These square seat cushions are 13.5″ and feature an easy carry handle. Very popular with high school sports teams, booster clubs, college sports, automotive racing, parades, and more. Many color combinations available, order your custom seat cushions today!